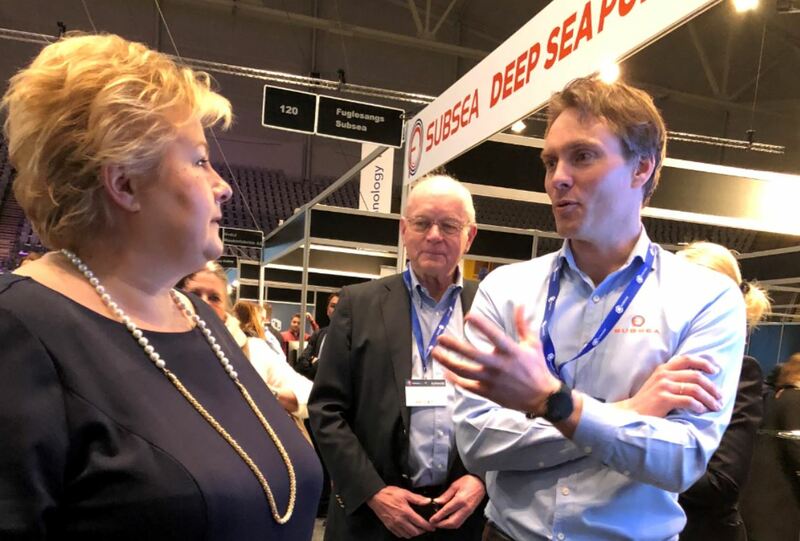 Photo: Norwegian Prime Minister Erna Solberg in discussion with FSubsea CEO Alexander Fuglesang. OSLO — Aker Solutions and FSubsea have agreed to create FASTSubsea to help operators increase oil recovery in a faster, simpler and more environmentally friendly way. Multiphase subsea pumping technology has the potential to increase oil recovery rates by more than 20%, but cost, space limitations and sometimes complex solutions means multiphase pumps are installed in fewer than 30 of the world’s 1,500+ offshore fields. With FASTSubsea, this is about to change. The new company combines Aker Solutions’ high-performance multiphase hydraulic technology with FSubsea’s game-changing Hydromag technology to create the world’s first “topside-less” multiphase boosting system. The pump-module solution being developed by FASTSubsea can cut capex by half and enable subsea boosting at fields where there is no available topside space. Getting more out of existing wells reduces CO2-emissions per barrel. “Creating FASTSubsea enables us to increase our speed to the market, reduce risk and reduce investment in multiphase test facilities,” says Alexander Fuglesang, which will take on the role of managing director of FASTSubsea. “Combining Aker Solutions’ subsea systems expertise and multiphase test facility with FSubsea’s Hydromag technology and lean mindset will benefit both companies. FASTSubsea has the potential to become a valuable addition to our portfolio of boosting recovery solutions,” says John Macleod, Aker Solutions chief technology officer. The agreement is subject to approval from the Norwegian competition authorities. The spread of subsea boosting technology has been hampered by cost and complexity. Conventional systems require a large amount of topside equipment on a platform or FPSO, including electric variable speed drives and supply systems for barrier fluid hydraulic oils. They also typically require several kilometers of hydraulic umbilicals between the pumps and the platform. This increases cost in the form of engineering and hardware spend. The pump-module solution from FASTSubsea leverages FSubsea’s Hydromag technology, which is a unique combination of the world’s most powerful Permanent Magnetic coupling with an embedded hydrodynamic variable speed function, and Aker Solutions MutliBooster semi-axial impeller design, which has proven best-in-class pressure generation capabilities. This system has built-in variable speed function and is barrier-fluid-less, which reduces capex cost with up to 50%. It unlocks opportunities with platforms that have no additional topside space but still can reap the economic benefits of increased recovery with subsea boosting system.